Wedding arch reception decorations can be a beautiful addition to your wedding day. 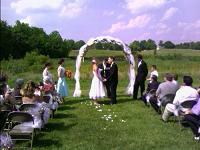 Regardless of the season of your wedding, arches can be an important part of your ceremony and reception. What Are The Types of Wedding Arch Reception Decorations? There are a few different types of that can be used for your wedding, however the most popular type is floral. Floral arches are typically wooden or metal, and they are often decorated with beautiful flowers. Vine flowers, like many garden wedding flowers, work very well. The flowers used on the arch can also be tied to your wedding theme and used throughout your wedding day, like in decorations and centerpieces for example. Fabric can also be used on wedding arches, typically in combination with flowers. Long pieces of fabric can be woven through the arch, and other accent items like bows can be added as well. Balloon arches are another common type of wedding arch reception decorations found at weddings. They are most commonly found at wedding receptions as decorations or for you and the bridal party to walk through when entering the reception. What Wedding Themes Work the best With Arches? Almost any type of wedding works well with arches, however outside, backyard, garden and beach weddings work really well. Indoor weddings are typically where you will find balloon arches, but in the right circumstance you may also be able to use floral arches at indoor weddings. Where Can I Use Wedding Arches on My Wedding Day? Saying your vows outside under an arch filled with beautiful flowers can be a memorable experience. Outdoor weddings are perfect for using arches, especially if they the arches are already located in a garden with flowers already growing on them. Even if you have to rent an arch or build it yourself, beautiful flowers and fabric can be added to the arch. 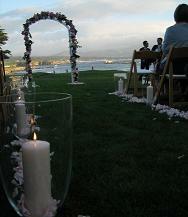 Think about where you are having your ceremony and if it is a good location for a wedding arch. At your reception, a balloon arch can be a nice touch. Perhaps you may want one behind or over your table, or maybe you want to walk through one as you enter your reception. Even if you don't say your vows under an arch, they can also make great photo locations. If there is one at your reception location or in a local park, consider having some photos taken there. If your wedding location already has an arch that has flowers growing on it, you can skip this step. However, that might not be the case for everyone. If you have the time and are capable, you can build an arch yourself out of wood. You can also buy a metal base arch to start with and build and decorate it to your liking. A better, less stressful idea may be to look for help. Florists can be very helpful with picking out the appropriate flowers to use and what accent items might fit in with your design and theme. Wedding planners are also a great resource that you can depend on not only for design ideas but with the actual creation of your arch. By working with trained professionals, you will lower your stress and increase the chances of having a beautiful wedding day.